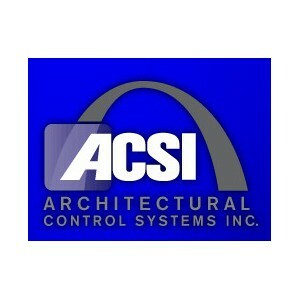 Architectural Control Systems, Inc. designs and manufactures a complete line of electrified hardware products for the architectural and security hardware industry. The sales and engineering staff provides technical support, system design, wiring diagrams and field systems checkouts for architects, specifiers and distributors. Door hardware solutions have been created for office buildings, hospitals, universities, airports, schools and government facilities. Provides power and control electronics for up to two ACSI 1550 Electric Latch Retraction Exit Devices. Latch Retraction Kit for Von Duprin 33A/35A & 98/99 series exit devices. UL listed. Series 1500- UL Listed modifications to a wide range of manufacturers' locksets. Electric hinge 4.5 x 4, regular duty with 8 wires. Satin chrome finish. Electric hinge 4.5 X 4, regular duty with 4 wires. Satin Chrome finish.